If you haven't figured it out by now, I love tacos! Mexican food has definitely been a helpful crutch throughout this new diet of mine, because I hardly run across gluten unless it's a flour tortilla. So last night, I came home from work to yummy smells of citrusy Fish Tacos. 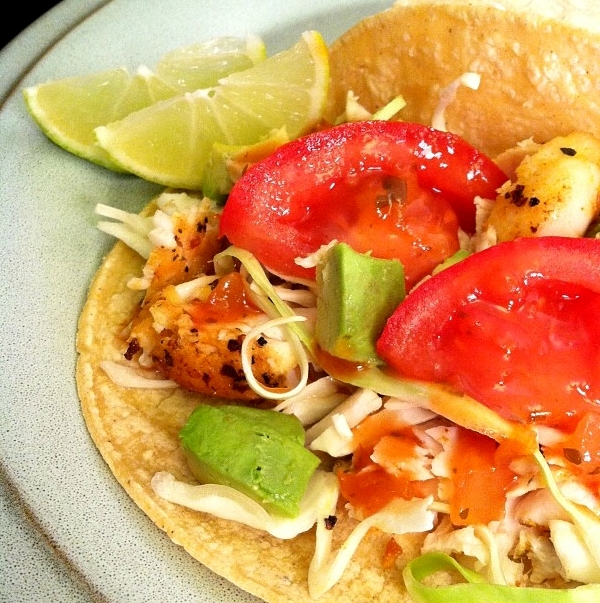 Orange Roughy was used for this particular recipe because it's a mild white fish. But you could also use halibut, cod, or any other mild white fish. And to give it some extra flavor, lemon pepper seasoning was sprinkled on top to add a punch of freshness and tang. We loaded the corn tortillas with all the traditional fixings and chowed down. Season both sides of the fish with a thin layer of lemon pepper and paprika. To taste, add the black pepper and salt. Saute in a pan (with a couple of tbsp of canola oil) on medium-high heat. Cook each side for about 7 mins. Remove the fish from the pan. Add the white wine to the bits that are left in the pan. With a wooden spoon, scrape up those bit and allow the wine to slightly evaporate (a few minutes). Spoon these juices over the warm fish and finish it off with fresh lime juice. Break the fish into small chunks and start loading your taco with the toppings - cabbage, avocados, tomatoes, salsa and more fresh lime juice! So glad I found your blog! I want to make everything! Thanks so much, Lindsay! Welcome and I hope you enjoy!